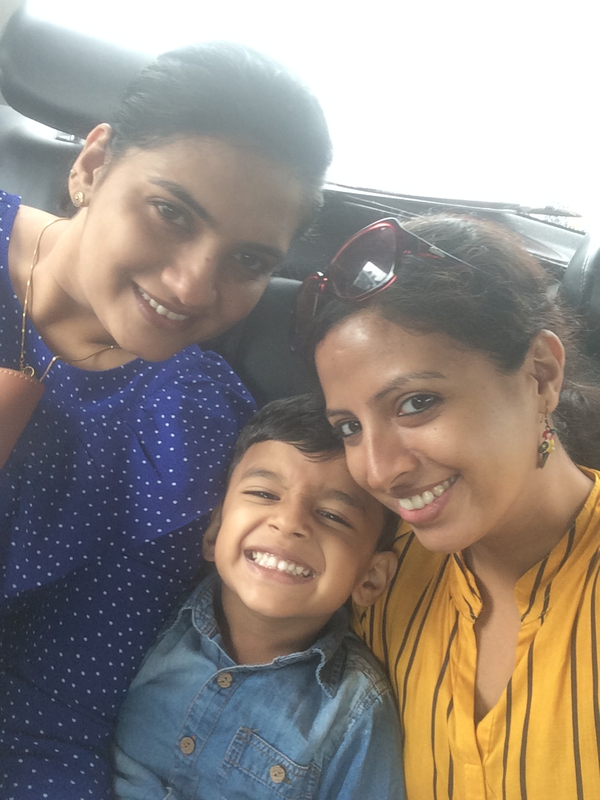 Last month, I’d visited Kidzania in R City Mall, Ghatkopar with my friend, her husband and her kid, Shlok. We’ve heard a lot about this place and wanted to try it out for ourselves. 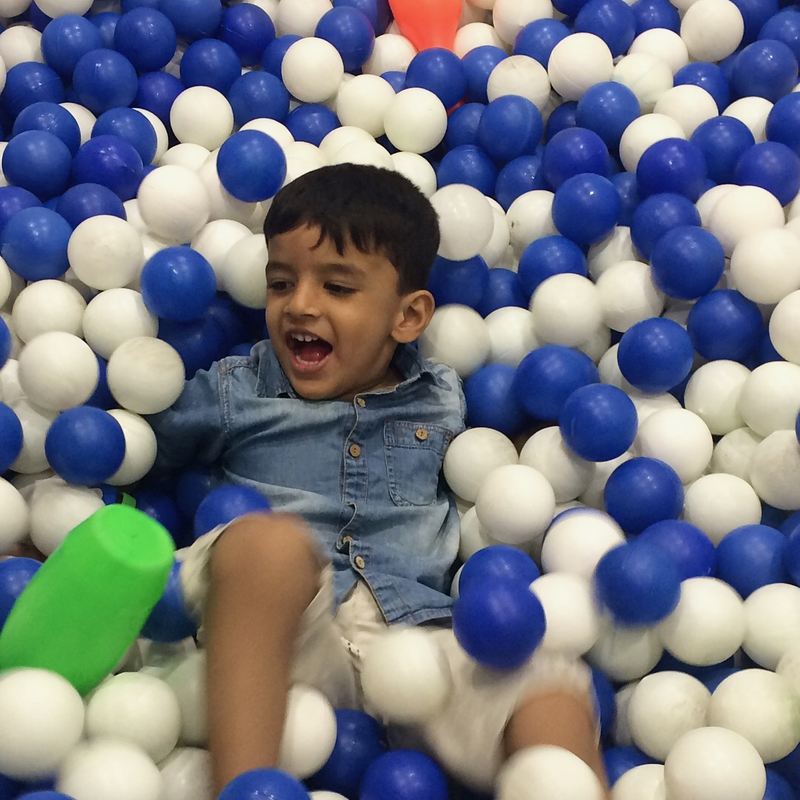 Shlok is 3 and a half years old and is a very active kid. The prospect of travelling and going to a new place excited him to no end. Once we reached Kidzania, we realised at the entrance only that it’s going to be a fun ride. The entrance is designed to look like an airport where the kids are asked to board the flight to kidzania. In Kidzania, kids are the rulers. Everywhere the place urges them to take their decisions, earn money, learn new skills and along the way have lot of fun! Kidzania is a new world with everything in it – malls, banks, police station, chocolate factory, construction site, ambulances and hospitals, firemen with their red truck, a dancing pub, an entire apartment made for kids with tiny furniture and a bubble bath! (Bubbles were small balls where kids can dive into and come out feeling like Uncle Scrooge). Shlok had a lot of fun in this bubble/ ball bath and spent a lot of time here. When we entered with Shlok, he was given a cheque of Fifty Kidzania currency. He needed to en-cash it at the Yes Bank situated inside for kids. The kids are supposed to pay money (in Kidzania currency) to learn new skills. But they are also paid to do work such as building a wall at a construction site, painting at the studio, dousing a fire engulfed building with water, etc. 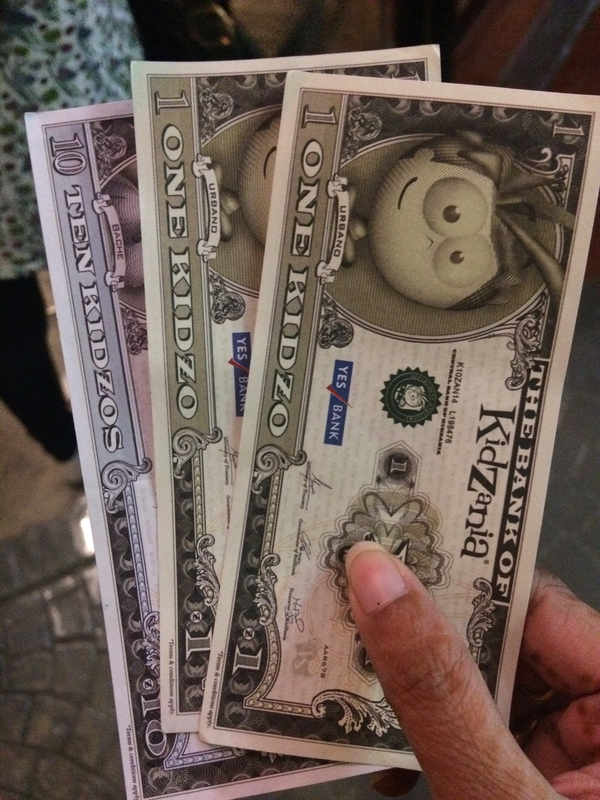 You can also use this currency to buy toys for your kids from Kidzania’s Departmental store. I personally loved the place and enjoyed every bit of my time with Shlok. 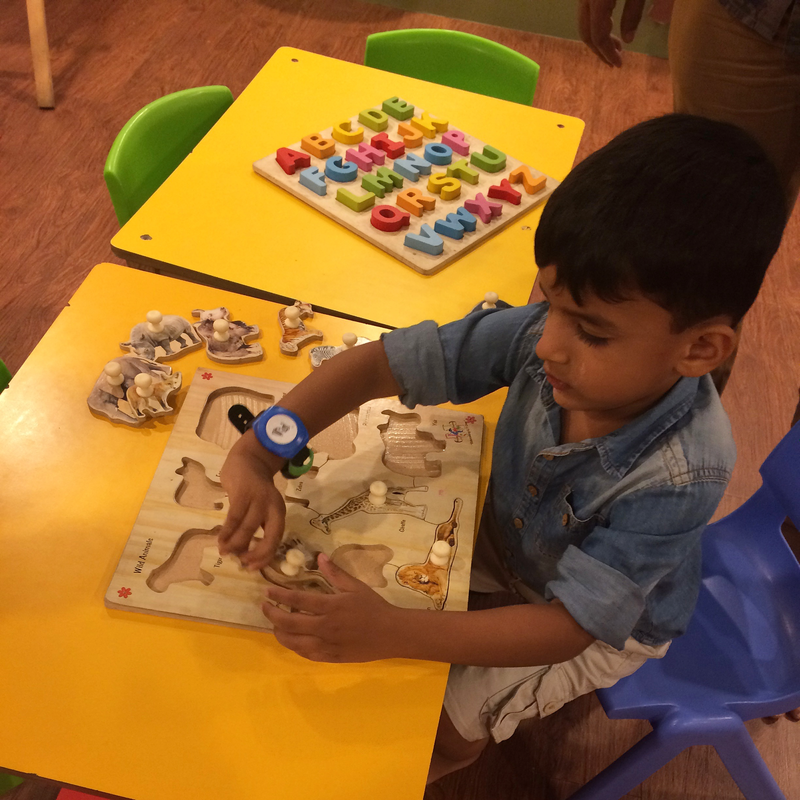 Here’s a sneak peek into Shlok’s day at Kidzania. 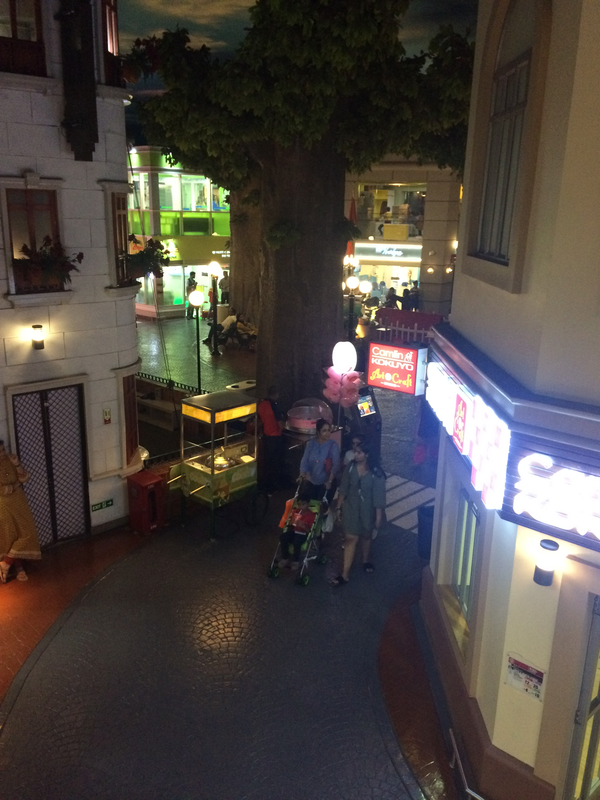 When we entered Kidzania we were mesmerised looking at an entire city like place created just for kids. 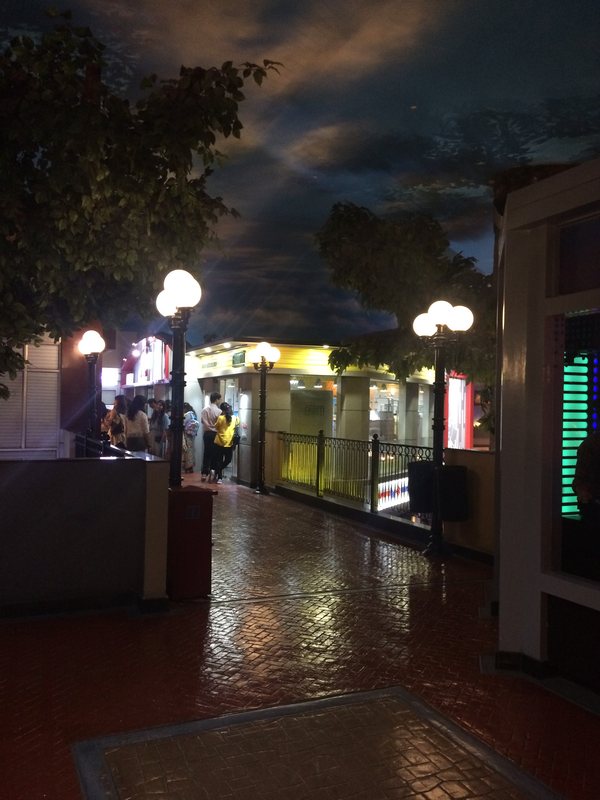 It also have this fake sky with clouds inside the mall to give it an outdoorsy appearance. Though it’s perpetually twilight in Kidzania! Walking on the streets, crossing well-planned shops, houses, standing on the bridges connecting shops and places of level one felt quite wonderful. 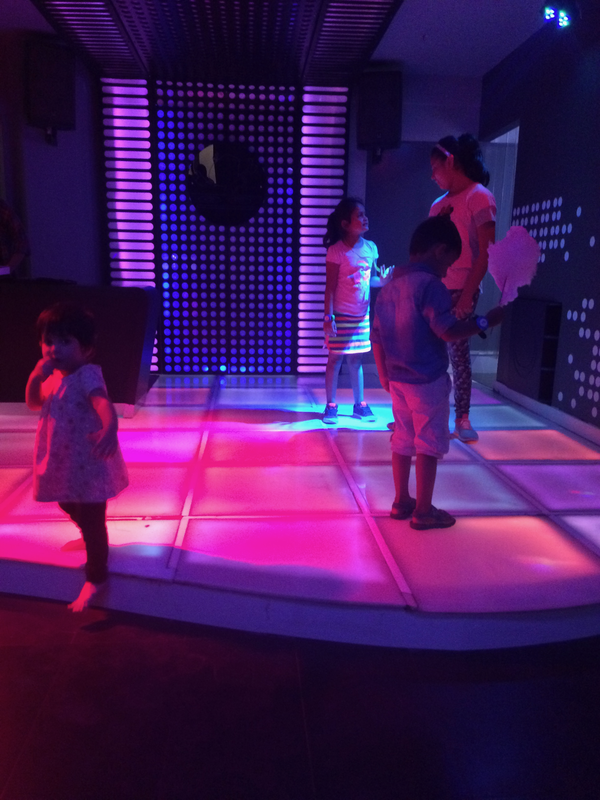 Here we are trying to make Shlok dance with the other happening kids at Kidzania’s pub. There was this cute little girl who danced so cheerfully. Our kid showed his shy side on the dance floor but he was quite content sitting on the sidelines and watching other kids dance. 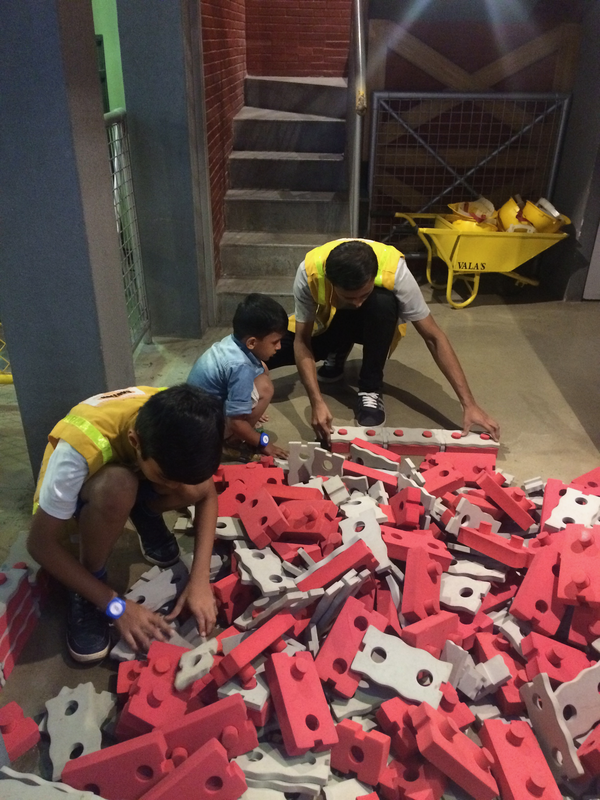 One of Shlok’s earning activities involved him working at the ‘construction site’. He had to build walls using given red and grey slabs. It’s a great way to teach kids to build stuff. This exercise made him wonder about how things fit with each other and how the perfect pieces are always held in place. 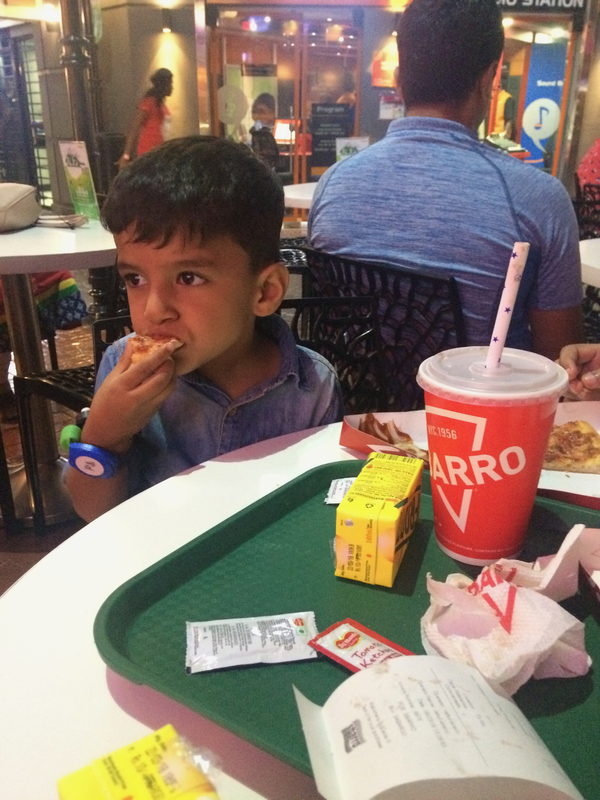 The hard working boy became hungry and so we made him eat his favourite food of all time – PIZZA! He loved the pizza and was quite dedicated to it. However, the one thing I didn’t like about the Pizza at Kidzania is that they don’t serve it with oregano and chilli flakes. They actually give you pizza slices with tomato ketchup! 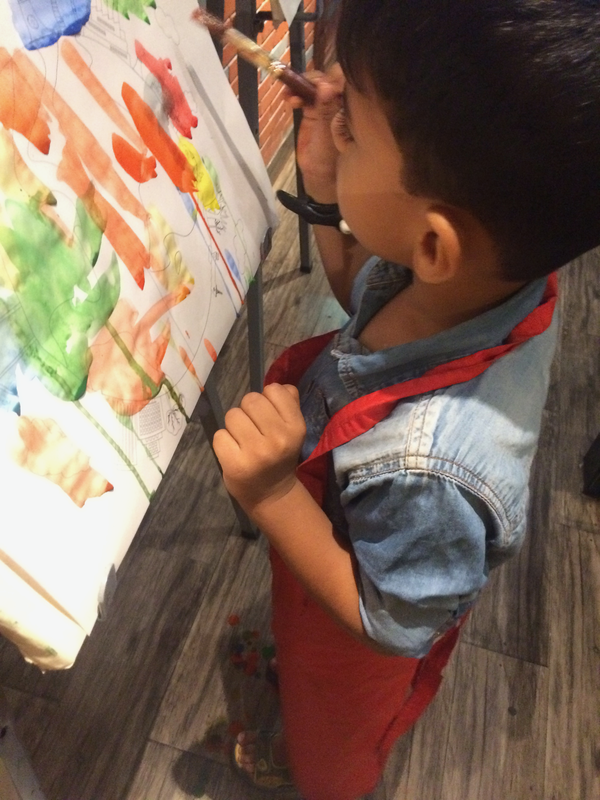 Another earning activity involved Shlok showing off his inner Picasso. I’m sure he has a long way to go but he was pretty happy using different colours and just splashing the brush on paper. He not only earned Kidzania money here but they also gave him small pack of colours to use later at home. I found it encouraging and thoughtful. Shlok loves to put things in their place. This was part of the small house built only for kids where they can sit and solve puzzles. Learn alphabets, animals, colours, etc. Since Shlok knew most of it, he was quite happy here. 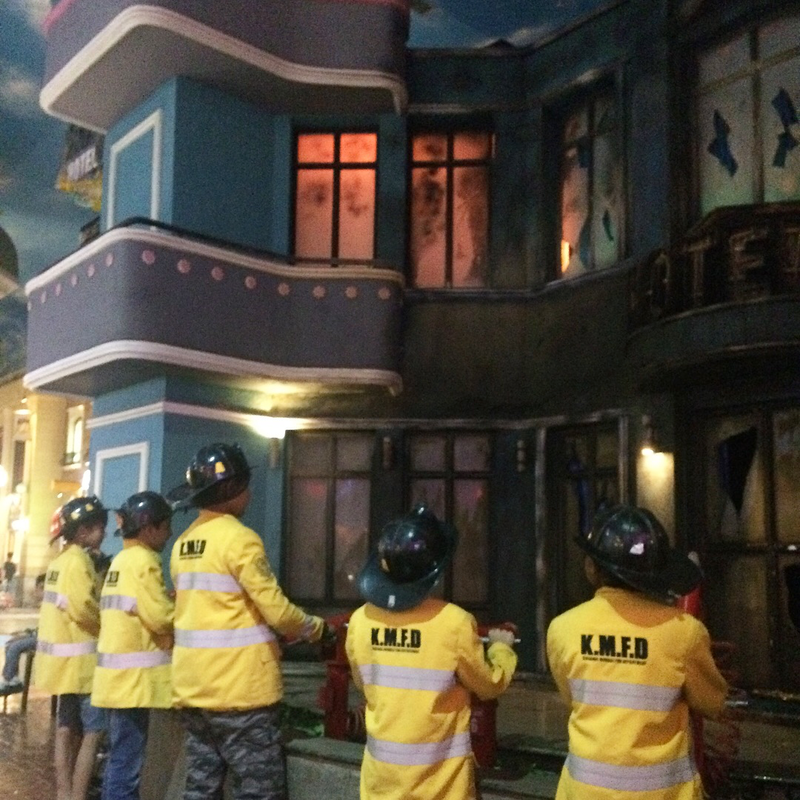 The kids trying to douse the fire at an old building at Kidzania. The kids are first given a lesson on firemen and fire drills and then they ride the red fire vehicle which takes them to the building caught in fire. The kids have lot of fun spraying water from the water pumps at the building! They even get firemen uniforms to wear and pose with. Overall Kidzania is a great place for kids to spend their day, learn new skills, meet other kids, bond while doing activities together, and having lot of fun. It’s good for parents too because it exposes their kids to lot of new things in a safe environment and helps with their physical and mental development. If you’ve a kid between 4 – 14 years old, this would be a great place to visit. The more, the merrier!